Caramel, Granny Smith Apples and White Chocolate..this one screams Fall Dessert! 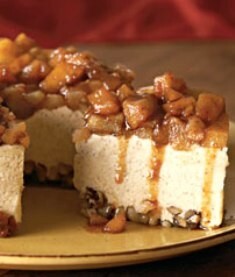 Our Caramel Cream Apple Pie is set on a roasted walnut shortbread crust. The crust is topped with our white silk that has been prepared with a bit of heavy cream and the traditional apple pie spices. This fabulous white chocolate Caramel Apple Pie Silk is then topped with marinated spiced and diced "GRANNY SMITH APPLES" drizzled with more caramel!